I think I can feel pretty comfortable with saying that Kill Bill Vol. 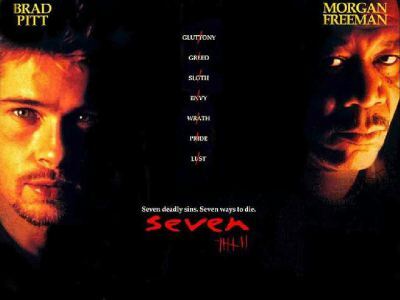 1 is just a simple revenge film. A fun and stylistic one, but at the end of the day it’s just The Bride tracking down people who have wronged her and then killing them. I speculated in my review of that film that the next one might offer some more profound aspects, and I’m happy to say I was right. Well, it’s not so much overwhelming profundity (though it is more profound than the first one) as it is more emotional depth. Keeping this in mind, Kill Bill Vol. 2 affected me more emotionally and on that basis, I’d have to say I liked it better than the first. So, as we left The Bride in Vol. 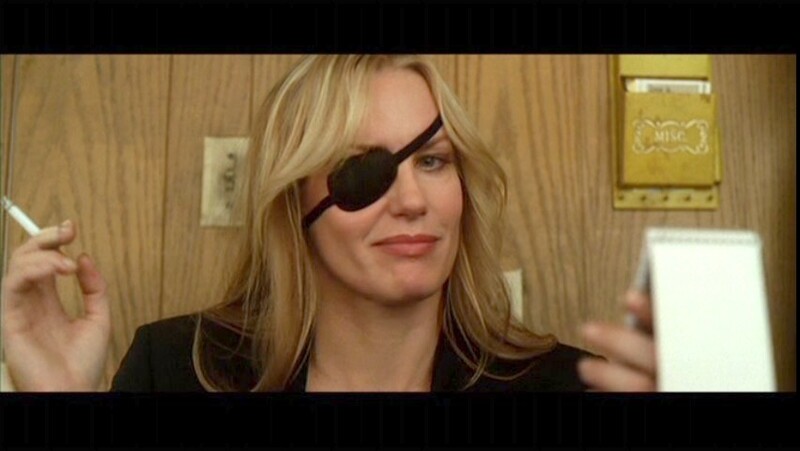 1, she still has to track down Budd (Michael Madsen), Elle Driver (Daryl Hannah), and of course Bill (David Carradine). The film opens with a fabulous example of her breaking the fourth wall and quoting the movie poster for Vol. 1. Before we can get back to the “roaring rampage of revenge” though, we get a flashback, explaining exactly what happened back there in El Paso. This is pretty interesting because not only do we actually get to see what went down, but we get to see the conversation Bill and The Bride had before it actually did. It’s the first step in a long line of them that builds up their relationship in such a way that makes the end pretty painful when they have to face it in the end. He actually seems pretty nice to her, like he’s going to forgive her for marrying some other guy and not being an assassin anymore. Of course we already know that this is not the case, but The Bride doesn’t yet so it’s pretty tragic. Alas, dramatic irony rears its ugly head once again. Next we go back to the present (or at least closer to the present) when Bill is telling Budd to be on the lookout. The Bride has already killed Vernita and O-Ren and it’s only a matter of time before she comes for him as well. This warning is absolutely warrented, as The Bride shows up not long after. Budd is sufficiently on his guard though, and is able to subdue The Bride, steal her Hanzo sword, and bury her alive. Budd makes a deal with Elle to sell The Bride’s sword, and things look pretty grim for her. Luckily (or unlikily depending on how you want to look at it), Tarantino assuages any fears we might have by showing exactly how The Bride will get out of this situation. It’s not like anybody thought she was actually going to die so early in the film, but I couldn’t help getting a little worried. Budd makes the classic bad guy mistake of not just shooting his opponent; obviously she’s going to make it out of this. But to increase suspense, we get another flashback. In its first part, we see even more of Bill and The Bride’s relationship that’s really tragic. They’re camping out and he’s telling her about the legendary martial arts trainer named Pai Mai (Gordon Liu). He of course is the most fearful martial arts master ever, who knows all the tricks and is just sitting on a secluded mountain until someone comes along that he can teach them to. He trained Bill, and apparently hates everything that The Bride embodies: white American women. However, she goes to train with him anyway, and eventually wins his respect as well as knowledge. Most important to her current situation, she learns how to punch through wood from mere inches away. I didn’t see Pai Mai ever cover how to punch through wood from mere inches away that also happens to be burried under six feet of dirt, but I guess the principle is the same(?). She is able to force her way through the coffin and the dirt, filling me with a sense of awe and heroism I haven’t felt since Batman climbed up out of that bottomless pit. As we heard in the first film, Elle, while hating The Bride, still hold an enormous respect for her. As such, she shows up to Budd’s sloppy trailer to buy The Bride’s Hanzo sword feeling very put out. The fact that this loser was the one to silence The Bride forever does not sit too well with her. She kills Budd with a black mamba snake hidden in the briefcase full of money, and I have to admit that I thought this was pretty awesome. I did not like Budd at all; to put it quite simply, I thought he was gross. She then calls Bill to tell him that The Bride killed Budd, and then she killed The Bride. Mission accomplished! Or so she thinks, until The Bride shows up right then and there. They battle it out, and it is revealed that Elle actually killed Pai Mai! Her depravity knows no bounds. The Bride doesn’t actually kill her, which I thought was strange and uncharacteristic. Checking wikipedia, I guess the idea is that the snake will get her soon enough. Only protangonists can get away with the “there is no way you can possibly get out of this so I’m just going to leave now before checking to make sure if you’re actually dead” thing. This is also the part where we find out what The Bride’s actual name is. I’m not sure how much of a spoiler it is, but since Tarantino was beeping it out this whole time I’ll put up an alert anyway: SPOILER ALERT! 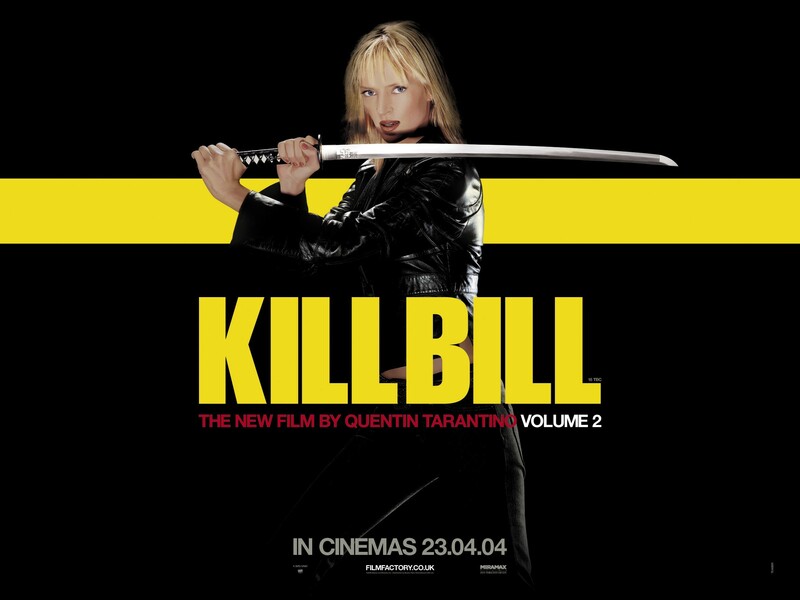 Her real name is Beatrix Kiddo; Elle reveals it when she calls up Bill to tell him she’s dead. I still don’t realize why he bothered to do that this entire time, or why he wanted to reveal it at this exact moment, but whatever. It has an interesting effect though, because in the flashbacks we’ve been hearing Bill call The Bride “kiddo,” and there’s me going “oh isn’t that cute!” when really it’s just her name. Her last name at that, so that’s even more removed than a term of endearment or her first name. Regardless, it’s clear that they had a relationship so I don’t know if it was really necessary to create all of that importance surrounding her real name. It’s kind of cool in retrospect, but when he’s beeping out the name it’s just kind of annoying, and since we have something to call her her lack of name isn’t that noticable. This leaves only one person left on the “death list”: Bill himself. As we found out at the end of Vol. 1, The Bride’s daughter is actually still alive though The Bride doesn’t know it yet. In the film’s final scenes, The Bride is confronted with Bill once again and also with her daughter BB (Perla Haney-Jardine), who is now about four and just about the cutest thing you ever saw. It’s very off-putting to go into this scene expecting some vengeful act of violence only to get a four year old and her dad playing with plastic guns. BB seems happy and carefree, but the three of them have this conversation involving her dead fish that’s actually pretty disturbing if you think about it. Later, Bill describes The Bride as a “natural born killer” (hey didn’t Tarantino write that movie?) and I almost wonder if BB is the same way. I mean she’s running around pretending to kill people and actually killing fish so I have to be a little concerned here. It also could just be Bill’s parenting skills, or lack thereof, which The Bride was originally trying to save BB from. The old nature vs. nurture debate strikes again. The main reason I believe this film is better than the first is that it involved me more emotionally. The first I wasn’t too involved with, I was rooting for The Bride but I didn’t have as much of a reason to for the most part. Getting more of Bill and The Bride’s backstory really added a whole other dimension to the film. This really isn’t a criticism of the first as much as it is praise of the second; I mean they are supposed to be one film so it just depends on when he puts the flashbacks in, and they happened to be in the second part. I really want to see The Whole Bloody Affair (which is the original film that premiered at Cannes encompassing the two parts) and see how it compares. I’m kind of confused as to whether that’s actually available anywhere though; so far I’m thinking not so I’ll just have to be content with the two parts. Regardless, the ending is where the film(s) truly shines; you get all of this stuff with The Bride being a mother and how she reconciles it with her “natural born killer” side, and how Bill is not able to, which leads to the conflict in the first place. It’s very heartwrenching to see her with Bill, but eventually the ending is pretty hopeful, even though it acknowledges that there’s always going to be some part of you that you can never escape. I’m nearing the end of my Tarantino quest now, and I’m kind of sad that it’s almost over. Mostly I’m triumphant though; I really only have one film left and then I will officially be able to say I’m a Tarantino fan! Yay! Then I’ll have to go crazy with ranking them all and everything, but until then I’ll just say that I enjoyed and appreciated Kill Bill Vol. 2 very much. I liked how it drew everything together with the flashbacks, as well as adding some more things to think about and some more emotional depth. It’s a very good film that has everything I’ve come to expect from Tarantino. Well, there you go… so you actually like the second one more. I preferred the first but they’re both excellent films. I’ve always wondered if Tarantino ever really did think they were one movie or whether that was just a marketing thing – I mean, they both have a very different feel from each other and you couldn’t cut enough out of either to make a single film much under four hours. From what I understand, it was originally one film that premiered at Cannes that was like four hours long, but for then they made it into two parts so they would make more money and it would be easier to sit through in two parts. I guess he showed the whole thing like once in 2009, at some theater in LA, but as far as I know that’s all there is to it. I could be wrong though, becuase I couldn’t find anything that explicitely said “you can never see the whole thing as it has not been released on dvd.” From what I’ve been able to find out, I think that’s how the situation stands. I guess, for me, Vol. 1 just got me from the moment it started and didn’t let go until the credits rolled. It was in your face and brash and beautiful and relentless. The second one just didn’t involve me as much as it did you… don’t get me wrong, I still really liked it but I didn’t connect emotionally as much as you. Ok, fair enough. I guess if you saw it in a certain way, Vol. 2 could seem kind of contrived…. I think seeing Vol. 1 in the cinema helped – it’s such a spectacle. But you know, I haven’t seen either of them for years – I may change my mind if I saw them again. Seeing something in the theater usually helps, that’s true. I hope you get to revisit them again; no matter whether you change your mind or not, they’ll be real fun to watch! I think Volume 2 is better than Volume 1 as well. I feel like seeing them both again now. Nice review. Good review Hunter. Vol. 1 is better for me, but Vol. 2 still has it’s moments. Still, I wish they were presented in the three hour formula like originally intended. Definitely would have still worked. Yeah, I really want to see the whole thing. If that’s even possible, which it’s not looking like it’s going to be. Ah well. ‘Volume I’ was more preparation mixed with a final Martial Arts show down. While ‘Volume 2’ is much more revenge with a modern ‘Spaghetti Western’ vibe running throughout. The whole project works better in two parts. Hey Jack, Thanks! I guess all of these stylistic differences are sort of lost on me really. I feel like it would better if we just got the whole thing at once, but to each his own. It seemed like it definitely could have been all one film to me. I prefer Vol.1 but only by a little – they are both fantastic films! In fact my preferred method of watching these is to watch them back to back. They are both great films, that’s for sure. I wanted to watch them back to back, but I had a bunch of other movies to review in between so it didn’t work out that way. I’m definitely going to do that next time though! I’ve only seen the first one. I should get around to seeing Vol. 2 soon. Great review Hunter! Thanks! You should definitely try to see Vol. 2 as soon as possible. Honestly, I don’t know how long I could have held out, given the way the first one ended. I’d be interested to know which you think is better, once you get to seeing Vol. 2.
i think this will go on my watch list. yes. it will. And then it will be watched. Yes, yes it will. Thanks for the reminder, I’m rewatching this movie soon.